Dadra and Nagar Haveli is an Indian union territory that lies in the western part of the country. While Nagar Haveli is located between Maharashtra and Gujrat, Dadra is an enclave that lies 1 km northwest surrounded by Gujarat on all sides. The shared capital of the place is Silvassa. Once ruled by the Marathas, the place has a rich history and boasts of a vibrant culture. More than half of the population of the region belongs to different tribal groups. 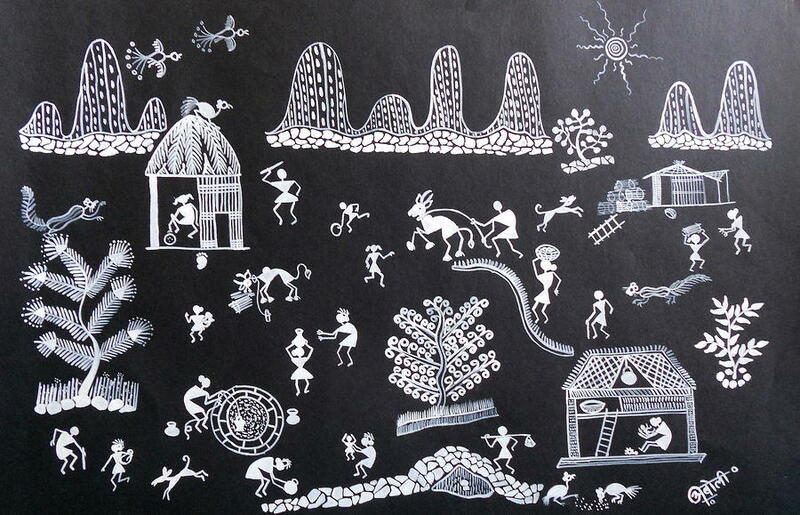 Varlies, Koli, Kokana, Dhodia, Dublas, Naika and Kathodi are among some of the tribes residing in the Dadra and Nagar Haveli and the culture, customs and traditions of each of these tribes varies to some extent. Folklores, folk dances and songs form an integral part of their culture. People belonging to this region are peace loving and the beauty of the place lies in the fact that different clans live in complete communal harmony. Hinduism is the main religion followed in the union territory though a majority of the people residing in Dadar and Nagar Haveli belong to the tribal areas and worship their local deities whom they see as the supreme power. The main deities here are Waghio, Hirwa, Himai and Dev. Different tribes follow their own set of rituals and traditions. For instance the people belonging to the Varli tribe mainly worship the sun and moon. Besides, Muslims and Christians also reside here and practice their respective religions. Dadar and Nagar Haveli house various temples, mosques and churches where people can offer prayers. Since the region is dominated by the Hindus, it is but natural that the Hindu customs and traditions are given importance here. Almost all the tribal villages here encompass a temple where these people worship their local deities as well as the traditional Hindu Gods and Goddesses. As in other parts of the country, people belonging to this region also dress up in vibrant clothes and wear beautiful ornaments during festivals and special occasions especially weddings. Giving respect to elders and living in peace and harmony is a part of their culture. Tribal people of Dadar and Nagar Haveli are attached to their roots and strictly follow the traditions. Since the region borders Maharashtra and Gujarat, the culture of the people residing in the urban areas is largely influenced by the culture and traditions of these states. The Bhili and Bhilodi dialect are the most prominent dialects used by a majority of the population living in the union territory. Marathi, Gurjati and Hindi are also spoken in certain parts, especially among the young educated people. Besides, there are various other tribal dialects that are spoken in various parts the Dadar and Nagar Haveli. The main tribes living in the Dadar and Nagar Haveli are Varli, Dodhia and Kokna and women from each of these tribes dress up in their own unique way. Dodhia Tribe: Women of this particular tribe seem to have a fascination for blue sari. Often seen clad in blue coloured saris, the women from Dodhia tribe also love wearing metal bangles, big kadas, necklaces made with beads and various other beautiful ornaments. Varli Tribe: Women from this tribe are seen clad in lugden which is tied around the waist and flows down until their knees. Known to be influenced by the Maharashtrian region, Varli is like a sari which is about one yard long. The upper body is covered by loin cloth, also known as Padar. The women belonging to this tribe also love adorning silver and white ornaments. Kokna Tribe: Women from this tribe love dressing up vibrantly and are seen adorning colourful saris. They also have a fetish for tattoos. You can see big and small tattoos engraved on their arms, legs and necks. Just as women, men from different tribes dress up differently. Dhodia Tribe: Men from this particular tribe living in the Dadra and Nagar Haveli wear a shirt, waistcoat and dhoti. They also wear different coloured headgears and beautiful ornaments around their waist and silver chains around their neck. Varli Tribe: Men from the Varli tribe wrap a loin cloth to cover themselves. This is coupled with a waist coat and a turban that completes the look. Kokna Tribe: Men from the Kokna tribe are often seen clad in a shirt, waistcoat and a dhoti. Unlike, the Dhodia tribe men who love adorning vibrant and colourful headgears, the men from this tribe keep it simple by wearing a turban. While these colourful attires form a part of the traditional costume of the union territory with a good number of people still seen dressed up in these, many men and women here have shifted to the modern day outfits such as jeans, t-shirts, skirts and ethnic suits. Barash: The festival which is mostly celebrated by the Varli and Kokna tribes is quite similar to the biggest Hindu festival Diwali. The parts in which these tribes reside are illuminated during this festival and their gods and goddesses are offered prayers with utmost devotion. Raksha Bandhan: Another main Hindu festival Raksha Bandhan is also celebrated here. It is mainly celebrated by the Dodhia tribe. Divaso: This is another famous festival of Dasra and Nagar Haveli. It is celebrated by the Varli and Dodhia tribes. Akha Tij: This festival is mainly celebrated by the women belonging to the Kokna tribe. Kali Puja: The tribal people living in Dadra and Nagar Haveli strongly believe in the powers of Goddess Kali and thus gather in large number to conduct Kali puja during the crop harvesting season. Tarpa Festival and Craft Mela, Monsoon Magic Festival and Children’s Film Festival are some of the main celebrations of the region. Folk dances and music forms a major part of these celebrations and people from different tribes participate with great enthusiasm to make these joyous occasions absolute fun. Besides these, various other Hindu, Muslim and Christian festivals are celebrated here as people belonging to these communities also reside in the region. The main sources of entertainment of the tribal people are folk lores and folk dances. Folk dances form a significant part of the life of these people. People belonging to different tribes dress up in colourful attires and dance to the tunes of various folk songs and musical instruments on special occasions such as child birth, weddings, festivals and important ceremonies. The different types of folk and tribal dances of Dadra and Nagar Haveli include the Tarpa Dance, Bhavada Dance, Gherria Dance, Bohada Dance, Dhol Dance and Tur and Thali Dance. One of the most loved folk dances of Dadra and Nagar Haveli, the Dhol dance is performed during the harvest season. It is especially popular among the people belonging to the Varli and Kokna tribes who perform it at night from September to March to please the presiding deities of the village. Dressed in beautiful colourful clothes these people dance to the tunes of timkis and dhols. Human pyramids are formed and various intricate acrobatic steps are performed as a part of this dance form. This folk dance is performed to show gratitude to the Gods and Goddesses of the village. People from different tribes dress up in vibrant attires and gather to perform this beautiful dance. An inseparable part of their lives, the dance is also considered most sacred as it is performed for the deities. The enthusiasm and the synchronization of the dancers performing the Bohada dance are definitely worthy of appreciation. This dance forms a part of the daily lives of the people here. They don’t have to wait for special occasions to perform it; it is performed in their routine lives though several people from different tribes are especially seen performing it during the festival of harvest. It is especially popular among the Kolis, Varli and Kokna. The dance is performed in a group where there is a leader who taps the ground with a decked up stick and the others hold each other around their waists and move around the musician. They all dance joyously to the tunes of the Tarpa, a wind instrument made of gourd and bamboo sticks. Another popular folk dance Gherria is performed by the people belonging to the Dubla clan mostly during the Diwali festival in the months of October and November. This is a group dance where in there is a leader who guides the rest of the dancers. While all the dancers are dressed up in colourful attires the leader is dressed very elaborately with a beautiful ornate headdress and holds a few peacock feathers in his hands. The male dancers hold two small sticks and strike it against each other every now and then during the performance just as in a dandiya dance while one of the dancers holds a long stick. 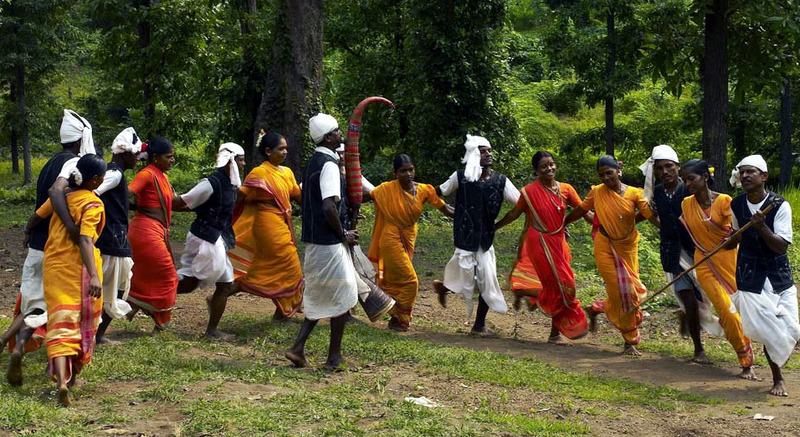 The musical instruments played during different folk dances are mostly crafted by the tribal people. Wood, bamboo, leather and gourd are among the materials used for crafting these. Mat Weaving has been popular here since ages and forms an inseparable part of the lives of the rural population residing here. 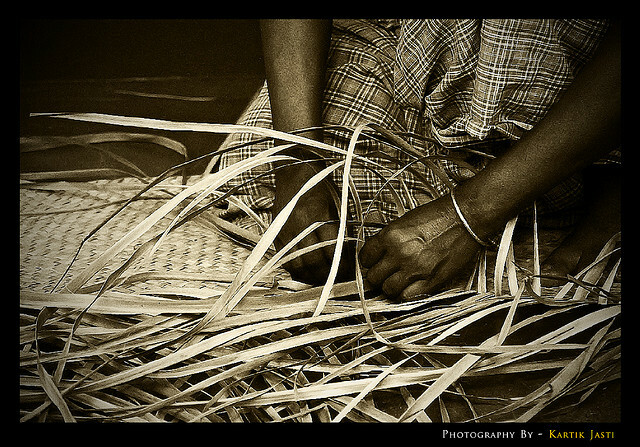 Tribal people have an expertise in weaving different kinds of beautiful mats. Mats weaved with bamboo twigs are especially a specialty of the place. Most people living in the rural areas of the union territory earn their living by crafting these mats and other items crafted with bamboo canes. Intricate designing is done and several artistic pieces are brought forth by putting in immense efforts. The mats reflecting the tribal culture of the clans residing in Dadra and Nagar Haveli are not only famous in this region but all across the country. Bamboo mats and other items prepared with bamboo twigs also make for great souvenirs for the tourists that visit the place. Leather crafts are equally popular and the local people belonging to different tribes are well versed in making different leather items. Leather slippers made here are especially famous across the country. These slippers are not only loved for their designs and patterns but are also popular because of their sturdiness and durability. Available at affordable prices at the local shops and retail stores, these are great for daily use. Various other leather items such as wallets and belts are also crafted by the skilled tribal people residing here and are sold at reasonable rates. These have thus become a rage among the tourists and are also quite in demand in the other parts of the country. The innovative and skilled artisans here also use their skills to craft beautiful baskets with bamboo canes. The tribal people of Dadar and Nagar Haveli have been crafting attractive bamboo baskets since so long that it has almost become a part of their culture. Several small and big baskets of different shapes and designs are crafted by the villagers and up for grabs at the local shops. These are so beautiful that you cannot resist buying a few pieces. Most of the tribal people of the region earn their livelihood by selling these baskets. Over the years, these baskets have also gained popularity in other parts of the country and even outside. Basketry is among one such handicrafts item here that has brought recognition to the place. Like every other Indian state and union territory, the Dadra and Nagar Haveli also offer some specialty cuisines that are not only popular among the natives but are also loved by the tourists and have found a place in the restaurant menus across the country. Just as the culture, the food here is also influenced by its neighbouring state, Gujarat. Even the salty and spicy vegetables and cuisines prepared here have a tinge of sweetness. Some of the famous cuisines of the region include bamboo shoots, mushrooms, pulses, gamthi, paunk, ubadiyu, khaman dhokla and doodh pak. People here also love having rotis prepared with different flours.